It seems the world is searching at the wrong spot for Noah's Ark. All sources seem to lead to the region around Mt. Ararat (Turkey/Armenia/Iran). I strongly believe that the ark never sank. 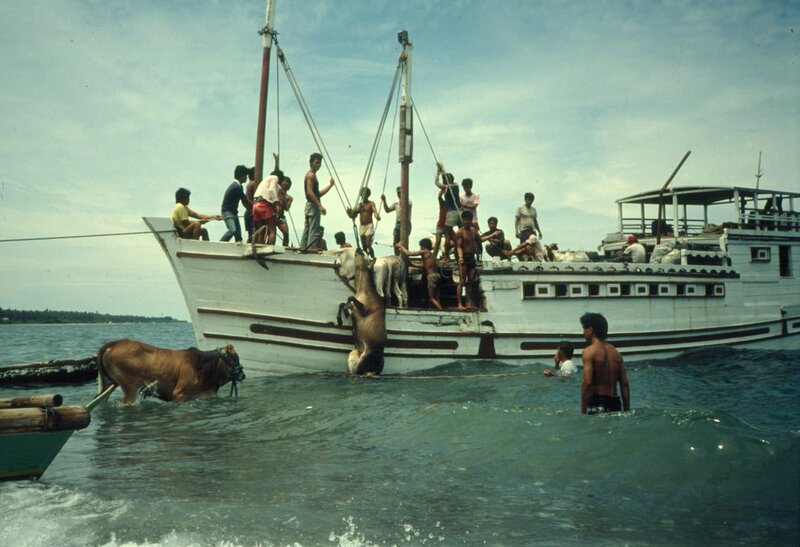 Last time Noah's Ark was spotted close to Roxas, Oriental Mindoro, Philippines in July 1986. 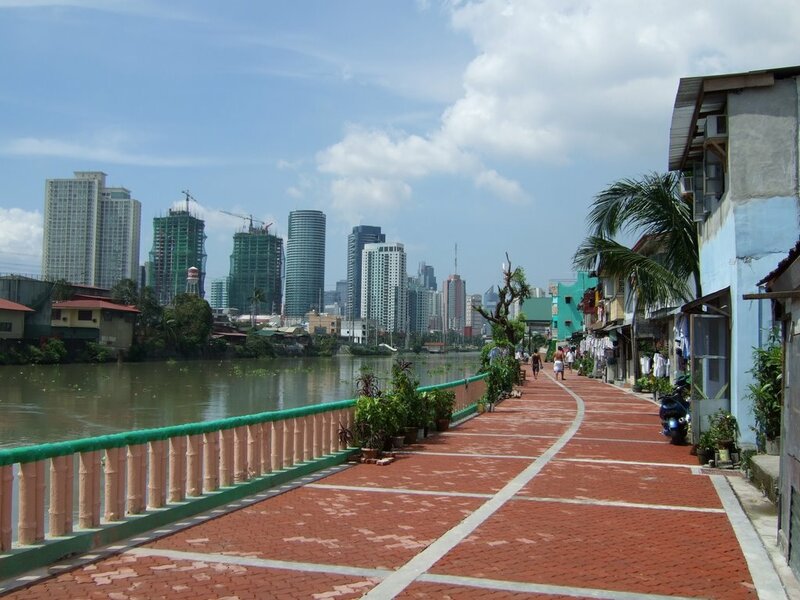 Can you imagine the change in perception on Manila if both sides of the Pasig River would get a boardwalk like the one in Mandaluyong as featured above? 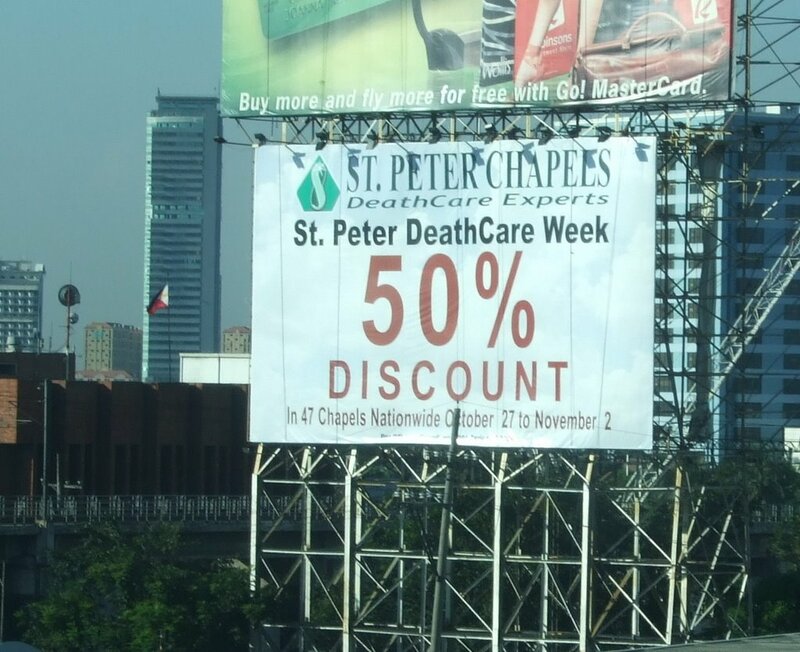 As I blogged about discounted funeral services on 23 November 006, I could not know that somebody well known in the Philippines would die the next day. Max Soliven passed away on 24 November. Max Soliven was one of the most influential columnists in the Philippines. He wrote Gloria's father Diosdado Macapagal into the presidency in 1961. He was arrested in 1972 after Ferdinand Marcos promulgated martial law. 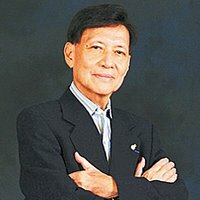 Released after a couple of months, he later co-founded (according to some sources) the Philippine Daily Inquirer, which immediately became a prominent voice in the fight against the Marcos dictatorship in the Philippines. He also co-founded the Philippine Star from where the above photo was taken. Let’s ask a basic journalistic question: Where did Max Soliven die? It's not 'Father Christmas', 'Winter Wonderland' or 'leise rieselt der Schnee', it's not 'gemütlichkeit' but pure fun. One of the most interesting times to be in the Philippines is around Christmas. The first ‘jingle bells’ starts in September and the last ‘snow falls softly at night’ you will hear in February. 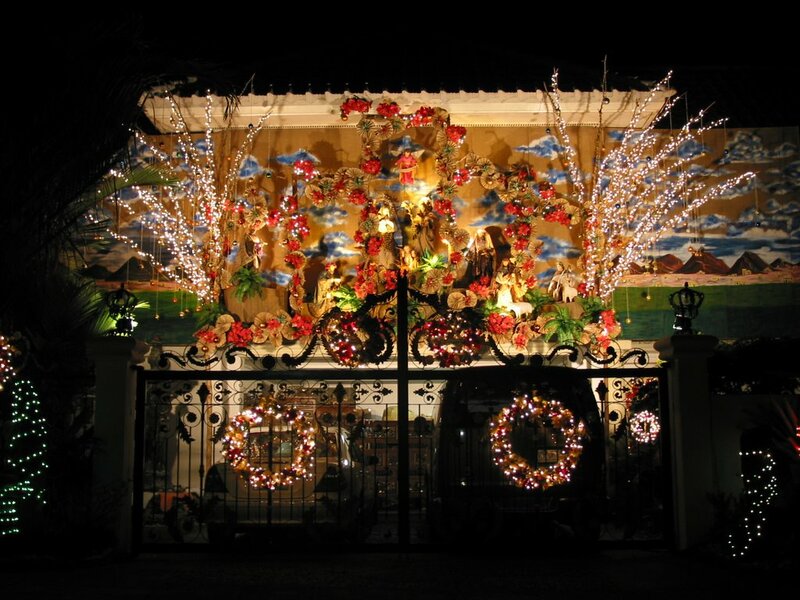 The biggest sport of the rich at this time is to decorate their houses. They buy lots of bulbs and hire their own wood carver to create their own homely nativity set. 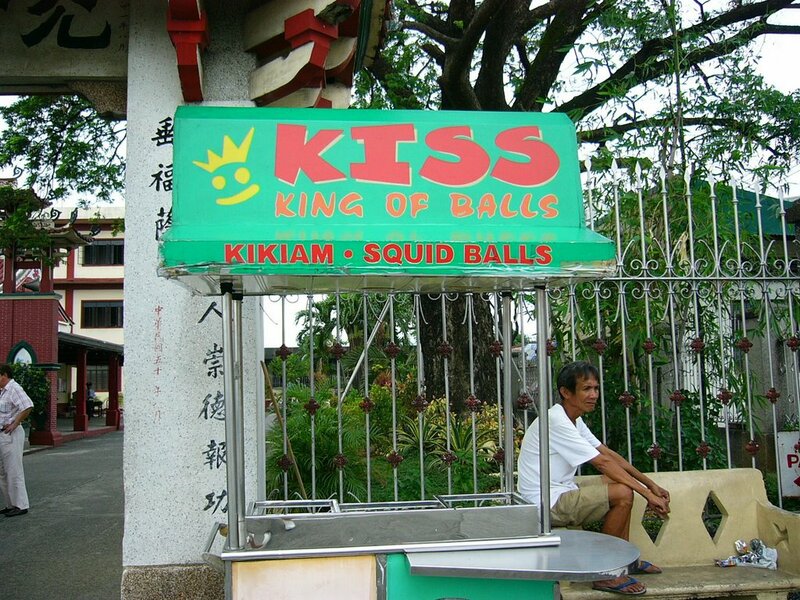 Photo from 2004 in Alabang (close to Manila). In Manila most of the billboards feature young and slim ladies making advertisements for clothes, credit cards or shampoo; some older women advertise for all types of diets and fat boys are usually used for ads to promote fast food restaurants or whatever is considered mouth-watering for such growing clientele. Who told you that Tarzan never visited the Philippines? One of my favorite spots in the Philippines is Lake Taal, a caldera lake. The lake is some 60km from Manila and easy to reach. You get a stunning view from the rim of the volcano onto Lake Taal. 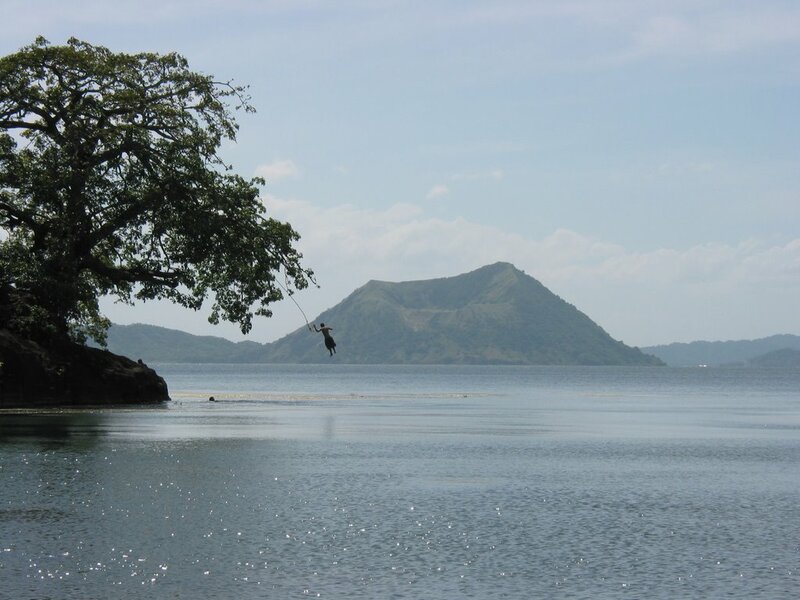 Right in the middle of the lake is another volcano, the one which is pictured above together with Tarzan. Photo from Talisay, Batangas in November 2004. 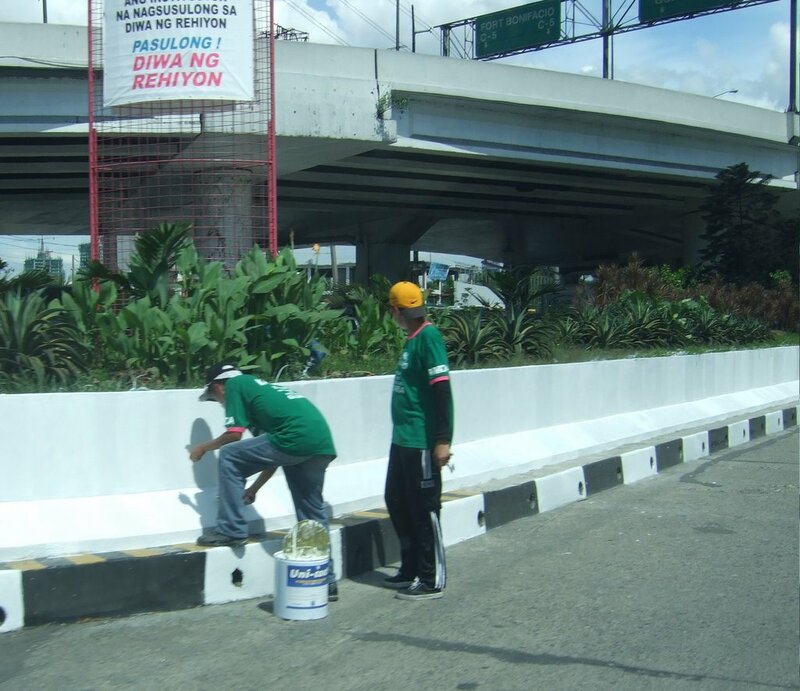 Painting walls is a fairly regular occupation you will see while driving along EDSA, Manila’s main inner-city highway. Compared to many other cities there are not many industries in Manila. Manila is suffering heavily from traffic pollution. 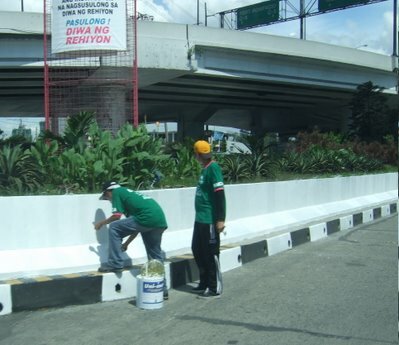 It seems that painting walls is the best way to fight such traffic pollution in Manila. Make the walls look nice and pollution is not problematic any more. It’s all about appearance, isn’t it? 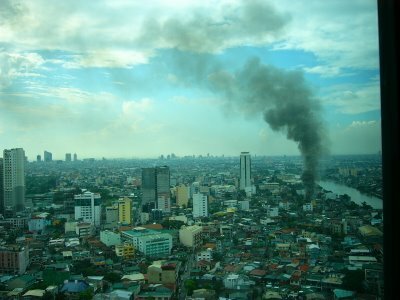 Photo from Makati, Metro Manila in November 2006. The picture above was taken in one of Manila’s numerous shopping malls and is showing a photo album. 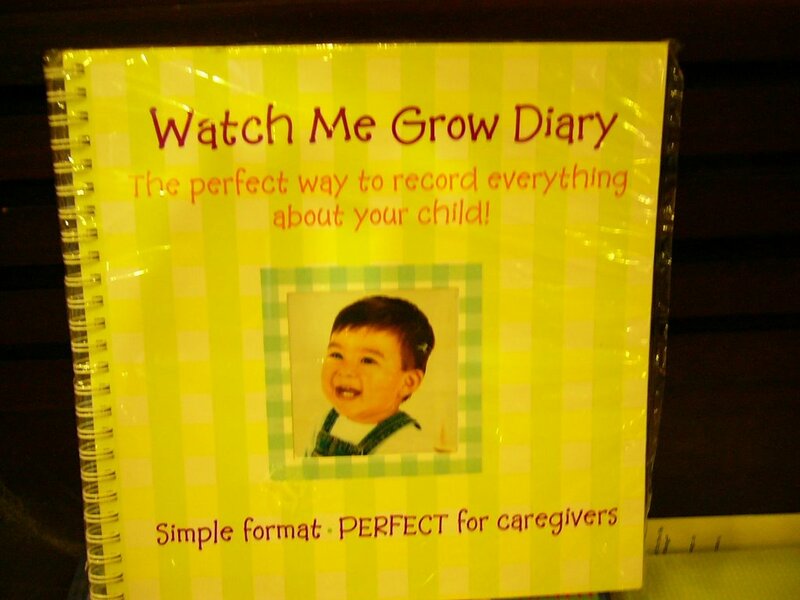 This photo album is not meant to be used by the child’s parents but by the caregiver. The picture is showing the potential buyer that this product is so simple that even a 'helper' can use it. Some of the giant billboards are back. New billboard installations are currently not allowed. What is still allowed is the giant TV on EDSA. Driving in Manila is nightmarish already, driving at night while watching the latest cars, the glitz and glimmer models or some horrible politicians is the climax of such nightmares. 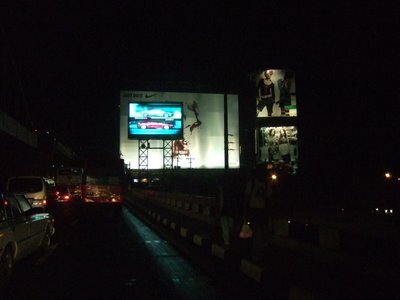 What the city of Makati really needs is a digicam which films all these accidents caused by that monster TV. Is there somebody who wants to donate such a camera? Thanks for coming. Enjoyed the birthday party. Photo taken just taken a few hours ago..... Manila, 18 November 2006. In conjunction to the earlier bathroom photo from Japan I need to tackle more fundamental questions about space and efficiency. 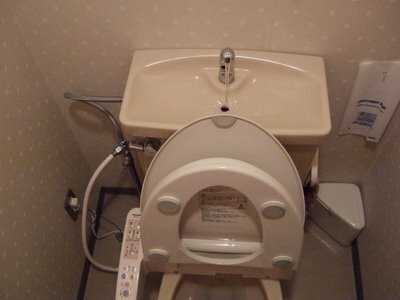 Space is clearly lacking in Japan and most bathrooms offer no more space than whatever is needed for a toilet. Now efficiency ticks in by leaving out space for a washbowl and placing the sink directly onto the water tank. Needless to say, if you flush the toilet then water comes out automatically from the faucet. The first catch is that it doesn’t stop after your hands are washed. The second catch is that nobody knows if it is drinking water. It's definitely no 'eau de toilette' I was told. 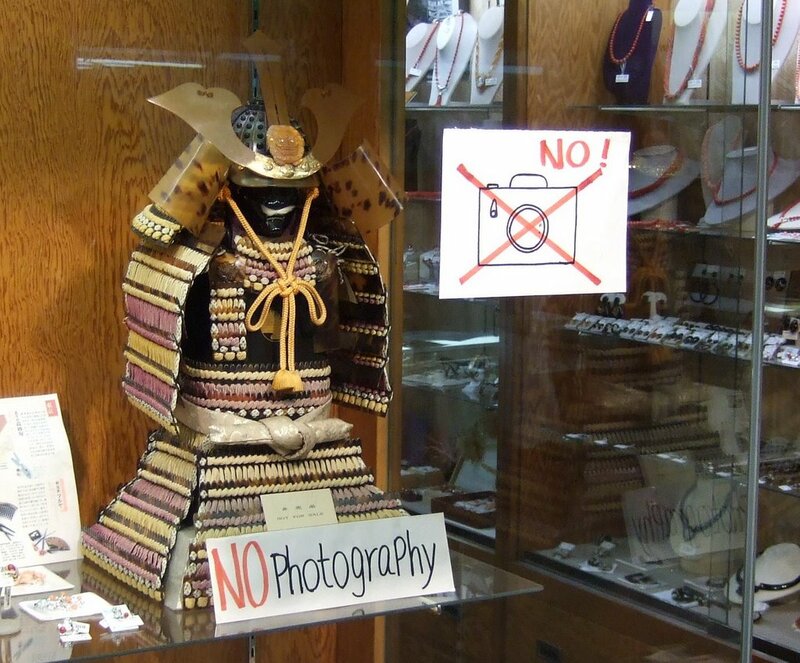 Photo from Miyajima, Japan in October 2006. 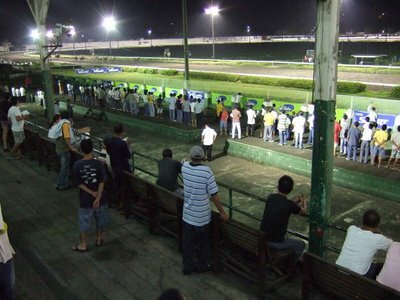 Spent yesterday evening on the race tracks of Santa Ana. It’s a great place to catch the atmosphere of betting on race horses. We bet on horses such as Federal Court, Just a Moment, Stradivarius, Friendly Fire, Shy Girl, Blitzkrieg, Society Climber and Pirouette (!). Minimum bets are 2 Pesos. Won 750 Pesos and will be back soon. 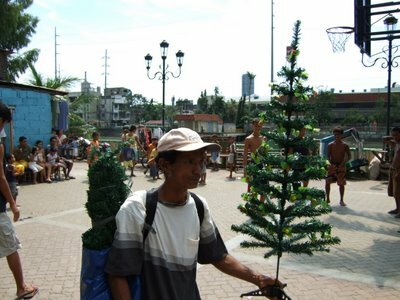 Photo from Santa Ana Park, Santa Ana (Metro Manila), November 2006. 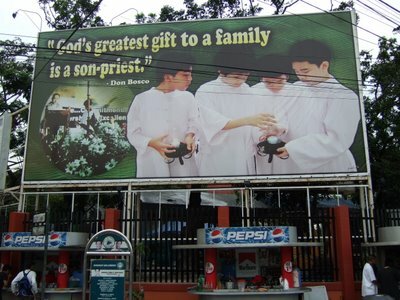 In how many other countries you'll find advertisements like the one above informing that God's greatest gift to a family is a son-priest? 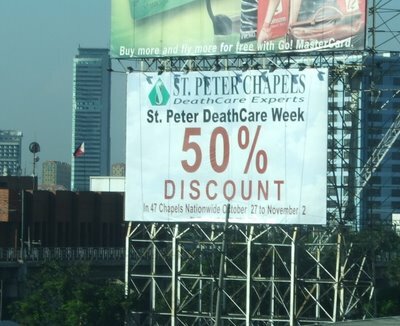 Photo from Makati in October 2006. 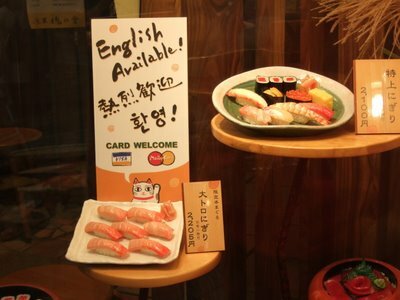 Seems that you have to buy your English in this Sushi bar (寿司屋) with your credit card. Photo from Tokyo in November 2006. Both pictures by Q were taken from our apartment in Makati in mid October 2006. The one below is the more recent one. Seems the fire is coming closer! Yesterday I asked 'Why Manila?' One more answer is presented above. Name a second country where you find an eatery with such a weirdo name as 'Kiss: King of Balls' inside a cemetery? 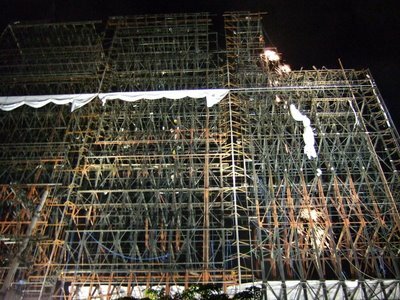 Photo was taken close to the crematory of Manila's Chinese Cemetery in October 2006. With thanks to Q! Early morning at MWAH, Mandaluyong, Metro Manila. As you know this fifth season in the Philippines starts as early as September and will surely not be finished before February. Some interruptions might happen during Halloween, All Soul's Day or whatever fashion show. Photo from Mandaluyong, Metro Manila in October 2006. 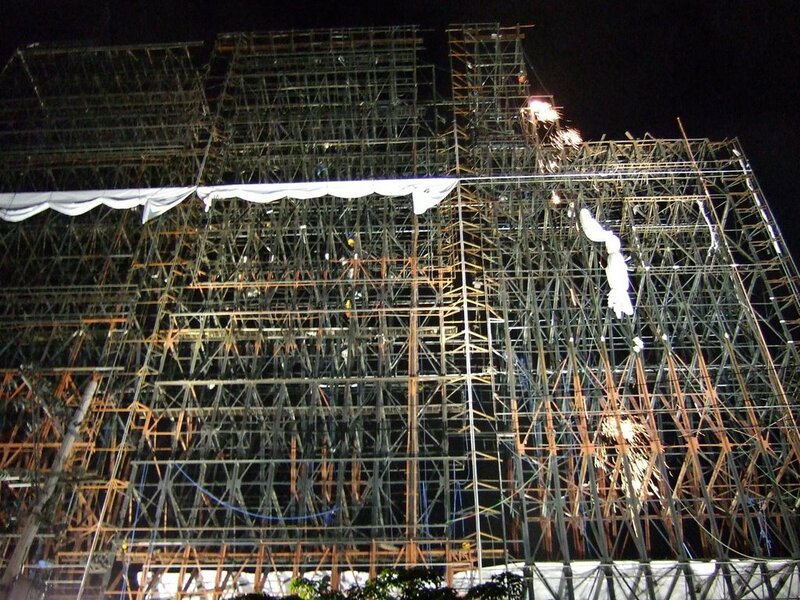 Work is going on as pictured above in dismantling the giant billboard structures. 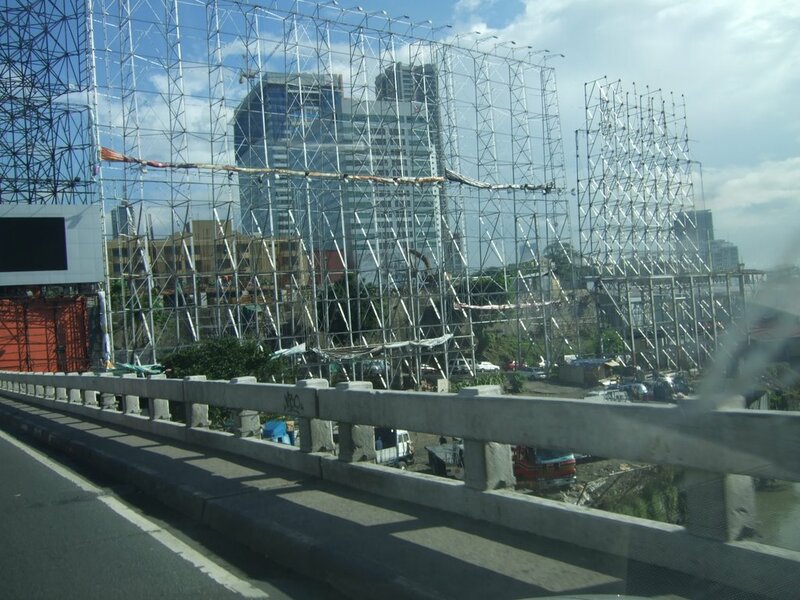 People will discover (in the morning) that behind this billboard structure at Guadalupe Viejo is a hill. Once the hill is back you might even spot the Jesus statue which seems to be Manila's version of the one in Rio de Janeiro on top of the Corcovado. 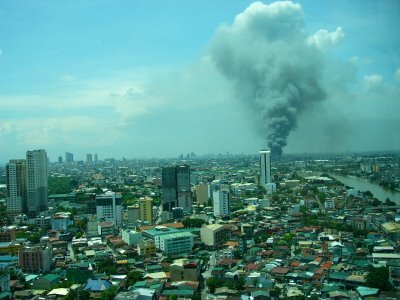 Photo from 8 November 2006, Guadalupe Viejo, Metro Manila. Can't agree more with TAFIM that we do need the billboards back. Driving is still entertaining in Manila due to one of the most absurd driving styles I'd ever observed in my life. If I can not watch nor read the monster ads I might even start to realize in what bad shape the roads are. EDSA used to be so uniquely dressed, now it fells like driving through a dinosaur skeleton. Picture from this morning, same place as the picture I took in July 2006. 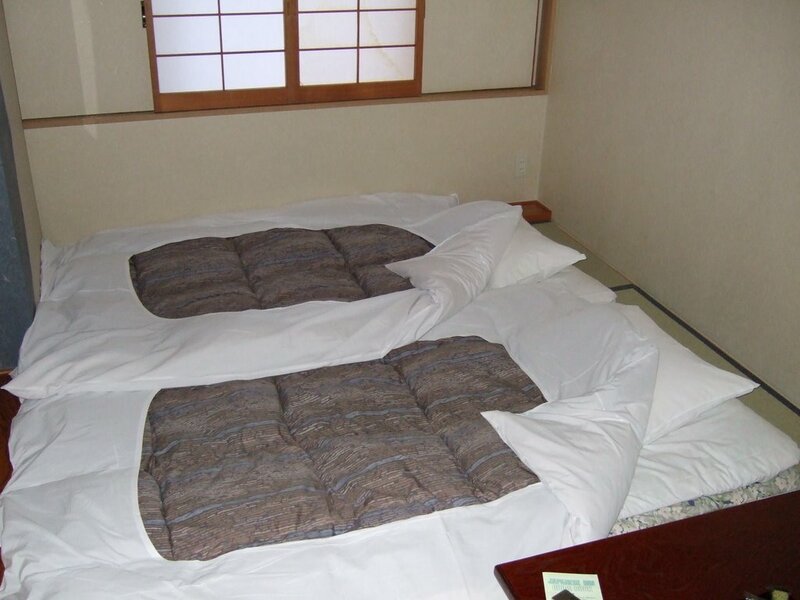 How much would you spend for such kind of room? On an already discounted basis that room costs ¥16,800 (currently US$142) without breakfast. Photo from November 2006, Tokyo, Japan. Some twenty years back, people would have laughed when told that one day smoking in public buildings would be prohibited. Ten years ago, you might have smiled at the idea of implementing such a ban in restaurants, and even in bars. 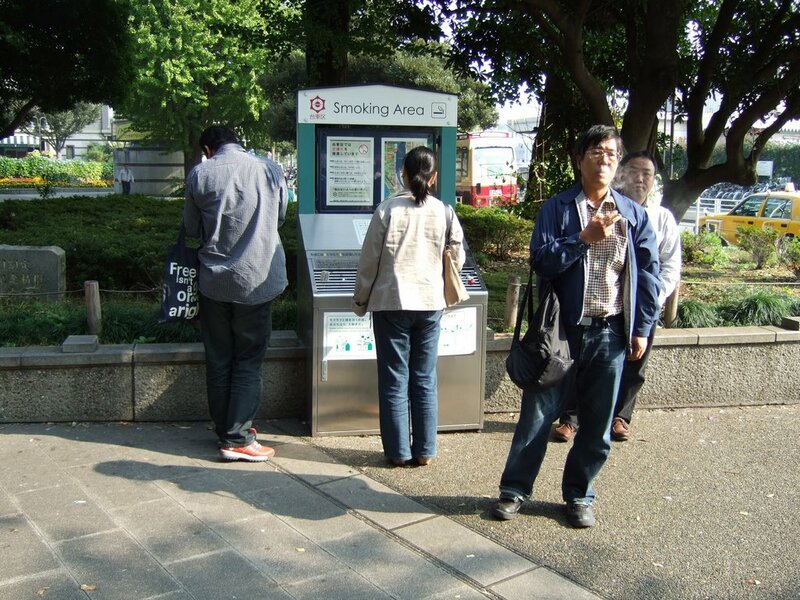 Now in 2006 you will find signs in Japan allowing smoking outside in designated areas only. Just watch the public smokers carefully, they might be gone soon. 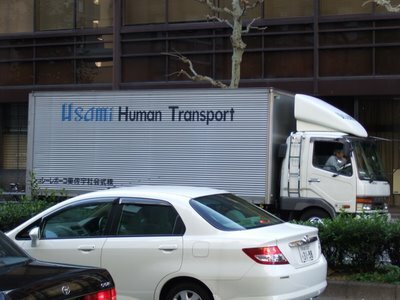 How many humans might fit into such a transport? 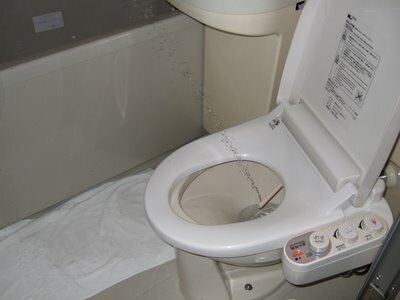 There is not much space for a separate bidet in Japan. The practical solution is presented above.